A plumbers job is to fit and repair the water systems in your home and will come to your rescue in a boiler emergency. To become a plumber, you have to have completed an industry recognised qualification – but this doesn’t mean university. In fact, in the plumbing industry, a more vocational route is often preferred than a degree. As such a hands on job, employers highly value practical skills and experience in the industry. You’ll find it much harder to find an organisation that doesn’t support school leavers in the plumbing sector than you would finding one who does! Apprenticeships mean you gain skills and qualifications through physically working as an employee. This means that not only do you become an expert in the industry and how it works but you also earn money as you learn. Plumbing is a highly transferable skill and once you have your qualifications, it could take you anywhere. The apprenticeship route is the most popular to start a career in plumbing. Perhaps one of the biggest appeals of an apprenticeship over university is the hands on experience you get during your training, as well as the idea of earning money instead of sinking in to 50 grand of debt. If you wanted to prepare before joining this industry as an apprentice or full time plumber, you could take a part time college course in the subject to boost your knowledge. This will add to your CV and get you ready for any responsibilities you’ll be given when you start working. Plumbing companies strongly advise you get some work experience under your belt before applying for a trainee position, and you don’t need any formal qualifications to apply for this. It’ll give you a better idea of how suited you are for working in the plumbing industry and shows you’re ready to start your career. I was lucky that I had a few personal connections who could point me in the right direction of how to go about entering the industry, as the advice I received in school wasn’t all that helpful. A couple of my friends are plumbers and my boyfriend works in the water treatment industry, so they offered me advice. 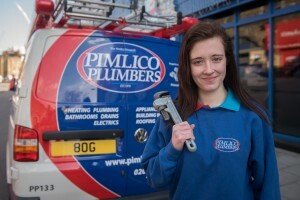 I then applied to Pimlico Plumbers, and was lucky enough to secure an apprenticeship with them. The best part by far is to see that you’ve helped someone, especially when they really appreciate it. To know that they’ve had a real problem you’ve been able to fix is so rewarding. When I left school, I wanted to find a career that was in an industry where I would never be out of work. I wanted a stable job, and plumbing certainly is that. The fact that I was learning trade which is totally transferable that could take me anywhere in the world was also a massive appeal. Charlie Mullins is a long time supporter of us, and ruler of the plumbing industry. Below, he tells us how his apprenticeship kick started his career. I‘ve been a plumber and heating engineer all my life. I was still in my teens when I started working for myself, and by the time I hit my early twenties, Pimlico Plumbers had spawned from the basement of an estate agent’s offices in, you guessed it, Pimlico in London. Today my company is a household name, employing 270 people and turning over £25m a year. It’s true that a lot of water has passed under Lambeth Bridge since we crossed it to set up on the south side of the river in the eighties, but there’s no denying that there’d be no Pimlico Plumbers today if I hadn’t once been a 15-year-old apprentice. I owe so much to my apprenticeship and the people that straightened me out along the way. The people who made sure that I stuck with it, even when my mates were earning double what I was getting, working in shops and labouring on building sites. Who knows where I might have ended up if my mum hadn’t taken me for an interview at a local plumbing company?